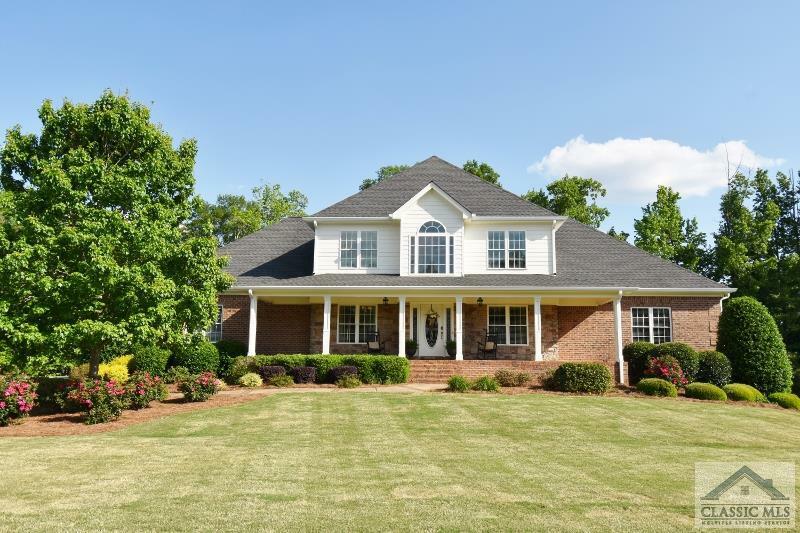 Welcome home to this exquisite find in Oconee's Oaklake Subdivision. Conveniently located near Hwy 78, Hwy 316, Oconee Connector, shopping, entertainment, dining, and medical facilities. Your guest will be greeted with an inviting covered front porch, custom driveway and a spacious 1.96 acre private lot. This 4 bedroom, 3.5 bath brick home boast a wonderfully laid out floor plan featuring hardwood floors on the main and coffered ceilings in the formal living and dining rooms. The formal living room opens to the family room with a beautiful stone fireplace. Off the dining room and family room, the kitchen is located with custom cabinets, granite countertops, double ovens, and eat-in breakfast area, and an unbelievable laundry room. To finish off the main level is the over-sized owner's suite with trey ceiling, large walk-in closet, and owner's bath with whirlpool tub, separate shower, and double sinks. As you go upstairs, you will find 3 large bedrooms. One with an ensuite bath that can serve as a 2nd owner's suite. Each bedroom has spacious walk-in closets. This home has been updated and cared for with new carpet upstairs, gas fireplace logs, new living room built-ins, new kitchen lighting, and new aluminium deck railings. Plenty of room for storage or expansion in the unfinished basement and don't forget to relax on the spacious deck overlooking the private backyard. Seller is offering a one year home warranty. .
Oaklake is a subdivision within the city of Watkinsville, Georgia. There are currently 0 Homes for Sale within Oaklake, with asking prices ranging from $0 to $0. The average list price per square foot of the available inventory in Oaklake is $0, which is the Watkinsville average of $249. The Average Sales price of all sold real estate in this subdivision for the past year is $403,500. Recent comparable homes have been selling for 96.37% of their asking price. Waterfront homes represent of the available Oaklake inventory. The population of Watkinsville, according to the 2010 Census, is 2,832. The total number of households in the zip code of Oaklake is 6,126, with an average household size for of 2.78 people. The total number of renter households within the zip code of 30677 is 1,117, which means that 81.77% of households in this zipcode are owner occupant households. 1231 Oaklake Terrace, Watkinsville GA 30677 is a Home, with 4 bedrooms which is recently sold, it has 3,307 sqft, 1+ - 2 sized lot, and Attached,Garage parking. A comparable Other, has bedrooms and 0 baths, it was built in and is located at and for sale by its owner at $ 0. This home is located in the city of , in zip code , this County Other, it is in the Subdivision, and Carolinas Place are nearby neighborhoods.